Happy Earth | Clothes for Conservation - Guest Post: You Can't BEE Serious? I’d like to start with a disclaimer that I myself have not been keen on bees throughout my childhood. As a kid running amok, I’d grow tense with fear when I saw them swarming around the flowers in my garden. Although I haven’t been stung by a bee since I was an adolescent, the mere reminder of my susceptibility to allergies - my skin swelling into the size of a baseball, pulsing red with irritation - still unsettles me. With that said, I’m not here to talk about my fears or misfortunes from the past, but rather the positive aspects of these small creatures. I’d like to change your perspective on bees; to tell you why you shouldn’t be afraid of them, and instead show them some love. Bees are important to human survival because of their contributing role in the pollinator community. Plants depend on bees, alongside other various pollinators, as a primary way to reproduce. Bees facilitate plant reproduction as a secondary effect of their daily activities. As they collect nectar from a plant, they pick up pollen which accumulates on their bodies. This pollen is then transferred to other plants as the bees continues its nectar-scavenging, fertilizing them and providing the first step in seed production. Although there are alternative methods of pollination (including transfer of pollen via water or wind), a large portion of fruit-bearing plants which play a major role in agriculture are dependent upon bees for pollination. A few of such crops are apples, cherries, almonds, blueberries, avocados, cucumbers, onions, strawberries, grapefruit, and oranges. 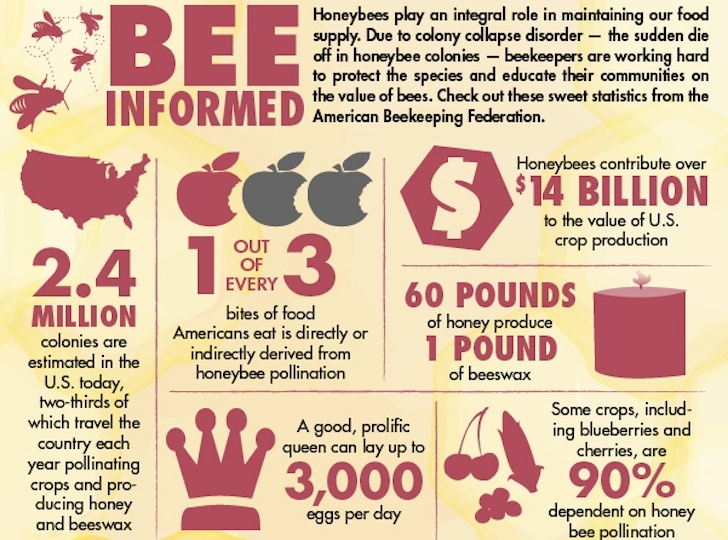 According to the National Resource Defense Council, over 15 billion dollars worth of crops are pollinated by bees alone in the United States each year. Unfortunately, bee populations have rapidly declining mainly due to human activity. US National Agricultural Statistics report a 60% decline in honey bees - from 6 million hives in 1947 to 2.4 million hives in 2008, and they claim that the issue persists. One of the most prominent contributing factors of the decline in bees is pesticides. The pesticides essentially act as a poison for bees that can cause several symptoms that eventually lead to the bee's death. The leading pesticides affecting bees are neonicotinoids. In fact, approximately 50% of the total wild bee species decline is associated with neonicotinoid pesticides (BBC News August 16, 2016). When pollinators such as bees and butterflies consume the pollen or nectar of a neonicotinoid-coated plant, the affects are often damaging. So how can we help? Green Peace suggests advocating for a ban on the most dangerous pesticides, protecting pollinator health by preserving wild habitat, and working towards restoring ecological agriculture. Remember, change begins with awareness - so share your knowledge and spread the word!